Today we are going a little bit more personal - I'm elated to share that my husband and I are expecting !! Baby Johnston is due January 2016 !! Here is a look at our gender reveal party! 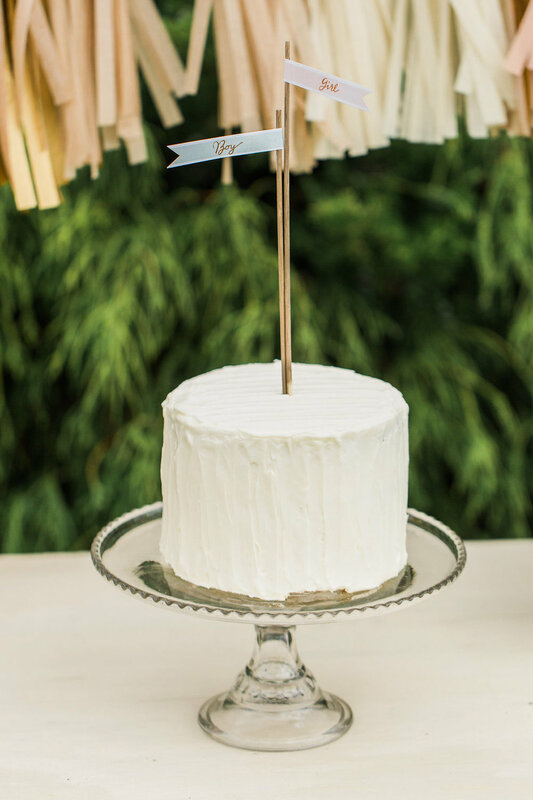 I had so much fun putting together our sweet little celebration! We had our ultrasound almost a month ago and had the tech write down the gender of the baby in an envelope. Everyone asked if I had peeked, or if it was killing me to not know what we were having when we had the answer sitting in an envelope in our home, but the truth was, I was so busy wrapping up my wedding season that I didn't even have time to think about it. Once wedding season came to a close, and I had more time to think about Baby, I knew we should plan a party, and quick! With our family's busy schedules, it worked out to where I had about a week to put together our Gender Reveal Party. I already knew I wanted to shy away from the typical "Blue" and "Pink" and so I decided to go with a color palate of Mint, Peach, Cream, and Gold. I ended up finding the cutest fabric - love when that happens, especially when on a time constraint - and sewed two sweet table runners. I love how delicate and darling Baby's Breath is and wanted to incorporate it, so I painted mason jars peach and cream and used them as vases. 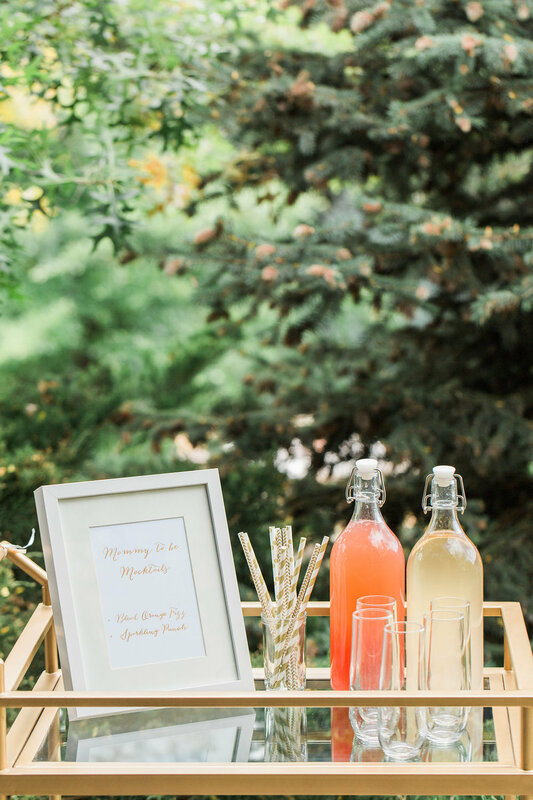 I spray painted jelly jars gold, which turned out to be the perfect little candle holders - and my favorite gold bar cart came in handy for "Mommy to be Mocktails". 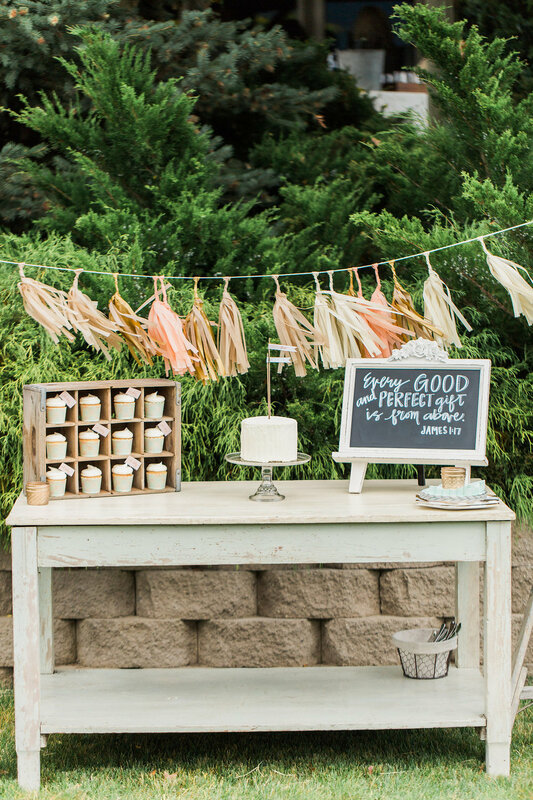 Our cute little Green Table worked perfectly for our Dessert Station! I made the sweet little Cake & Cupcake Toppers which I think turned out just darling. I Love when everything comes together in such a short time frame! Boy or Girl?! We shall see on the count of three! 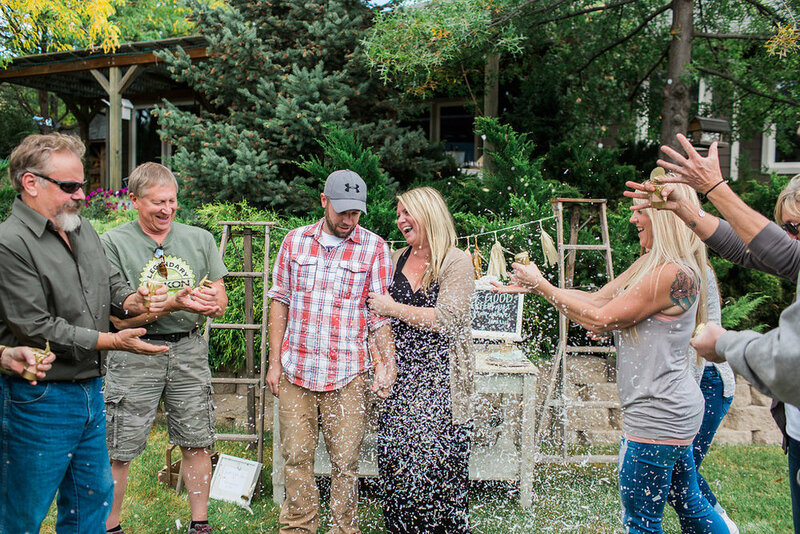 This was such an exciting moment that we shared with our family and it was so fun to all find out at the same time! I have had a feeling for a while now that we are having a Boy, so I half expected the Mint color to come out of the push pops - my husband on the other hand was thinking it was a girl. He looks confused in the pictures because the Mint colored confetti ended up being super light, so it took him a moment to figure out what color it was! We are both ecstatic to be welcoming a Baby Boy in January! A Big Shout Out, and Thank You to all the wonderful vendors involved!! My Sweet and Talented Friend Nicole, over at Nicole Conner Photography - You captured our party perfectly! Thank You to Lisa over at Cupcake Blues, who made our adorable and delicious Cake and Cupcakes. Josie from Chalk Chic who always does an Amazing job with her Chalk Art! 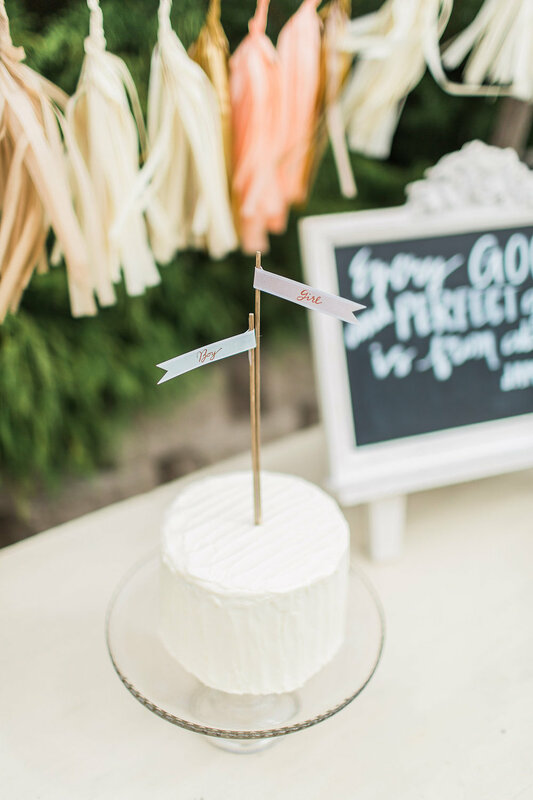 Brianne, over at Merriment Party Goods who supplied us with the ever so cute Tassel Garland, Cupcake Wrappers, and darling paper plates and napkins! And the Super Fun Confetti Balloon came from The Paper Kit .